If you like drumming then why not come along and have a go? Your first session is FREE. No prior drumming or music experience necessary. You’ll have a chance to learn new skills , make new friends and perform at local events. So why not contact-us and grab this opportunity to come along and join your local family-friendly community percussion group. Drumming classes will be held at St. Francis College, Broadway, Letchworth Garden City, SG6 3PJ and run weekly on Tuesdays from 7 to 9 pm. Blocks of 10 classes currently cost £45 (concessionary rate) or £70 (standard rate). We run weekly Brazilian dance classes. These are open to all levels but beginners must have a good level of fitness. 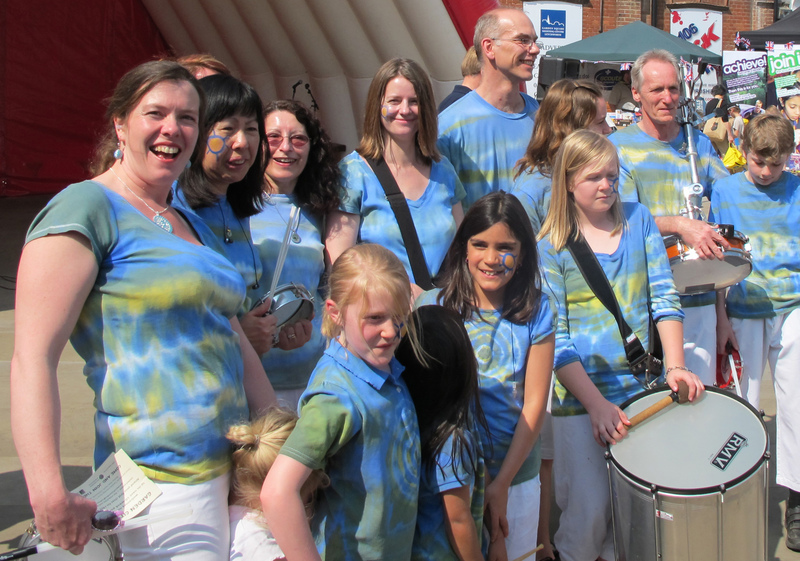 We’ll learn choreography to accompany the rhythms played by Garden City Samba drummers. Our classes are run by Brazilian dancer Marcia Magliari, a pioneer of Brazilian dance in the UK. Once you and Marcia feel you’re ready, you’ll have the opportunity to perform with GCS drummers at various local events. So if you enjoy dancing or would like to give it a try then why not come along for a FREE taster session. Dance classes are held at St. Francis College, Broadway, Letchworth Garden City, SG6 3PJ and run weekly on Tuesdays from 8 to 9.15 pm. Everyone who joins our group will benefit from the new skills they learn, make new friends and enhance the local community through performances. Drumming & dance have proven benefits for both mental health and physical fitness and we have seen first-hand how being part of an active community group can literally change people’s lives. Our classes are open to everyone, regardless of musical or dance experience, age, social or economic background. We wish to encourage young people, families and the hardest to reach people within the community to benefit from our activity. Our membership fees include concessions and special family rates. If you are interested in finding out just what drumming or dancing with a Brazilian samba band is all about, or would like to develop your rhythmic skills and musicality, and meet new and like-minded people then contact us for more information on our weekly practice sessions. You can attend your first practice session for FREE. On Tuesdays at St. Francis College, Broadway, Letchworth Garden City, Herts SG6 3PJ.